Formal name is "Esopus Spitzenburg". Originated before 1800 in Ulster County, New York. Grown by Thomas Jefferson. 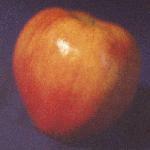 Parent of the Jonathan apple, it is a large, oblong, orange-yellow apple that is excellent for pies, juice, and fresh eating (at least for those who like to bite into a firm, crisp, and particularly tart apple). Ripens late September in the Willamette Valley. An excellent keeper.